White is the color of the season and Samsung has painted its LTE-equipped Galaxy Note in white as well. 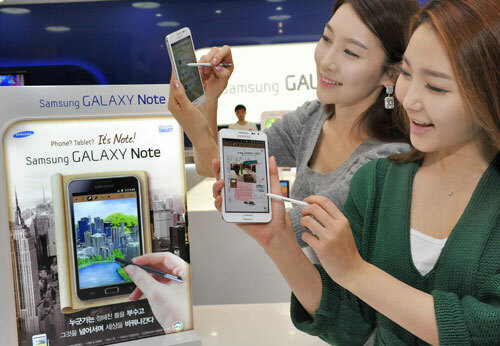 The newly colored Galaxy Note will be available in South Korea, which has sold in excess of 60,000 units since its launch. Needless to say, the specs remain unchanged, which means we’re looking at a phone/tablet hybrid featuring 5.3-inch HD Super AMOLED Display, 1.5GHz dual-core processor, 1GB RAM, 8MP camera, Wi-Fi, Android 2.3 OS and 2500mAh battery. any word on US launch ( white ) ? No. But the image of black AT&T variant is circulating on the web, which means it should be launched soon. And very pleassed to see the official announcement from Samsung that it will get ICS in the first quarter of 2012. It will make the Galaxy Nexus owners wish they has waited as the ICS bugs should be mostly fixed by then and more devs will have fixed their incompatible Nexus apps.